A 3-bedroom newly refurbished house with off-street parking for 2 cars and roof terrace with views to the river Camel. In a quiet location close to the centre of Wadebridge. The nearest beach is 5 miles away at Rock on the Camel estuary. Several golf courses within a 10 mile radius. The historic harbour town of Padstow is 8 miles away. There are magnificent cliff walks and innumerable coves and bays to explore all along this stunning coastline. Plenty of activities for children including horse-riding, cycle trails and surf schools. We have loved the South West and Cornwall in particular since our very first visit in the 1980s. We used to come here every summer for family camping holidays when the kids were small. It seems inevitable that we would end up buying a property here. We bought this house in Wadebridge in 2003. We liked Wadebridge because of its location on the river Camel. It isn't as as crowded or busy as some of the resorts on the coast but the nearest beaches are only 15 minutes by car. 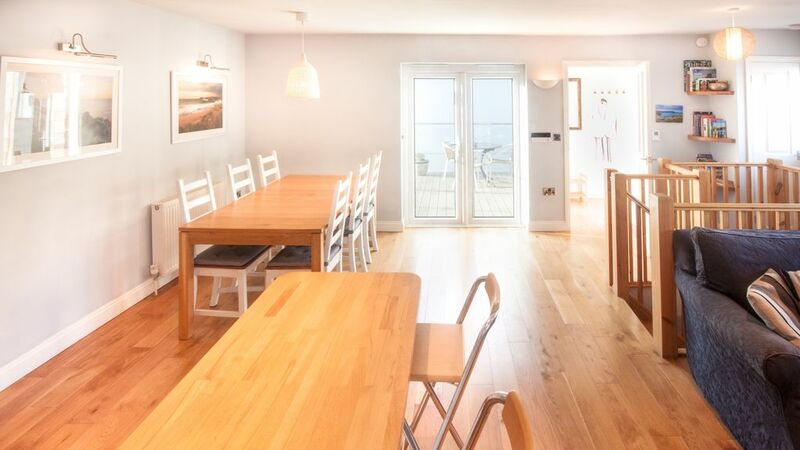 In 2010 the whole family completely refurbished the house and added a roof terrace overlooking the river Camel. Each year we use the winter months to improve and maintain the property so that it stays in top condition for the rental season. We love to sit on the roof terrace and watch the tide ebb and flow on the river Camel. The town centre is a 2 minute walk away across the river which is very convenient for shopping or going out in the evenings. One of our favourite beaches at New Polzeath is only a 15 minute drive away. Bathroom with bath, shower, sink and WC. En-suite bathroom to bedroom 1 with WC, shower and basin. Living/dining room with 3-seater sofa, chairs, 40" TV, DVD player, dining table and seating for 6. Oven, hob, fridge/freezer, dishwasher, microwave, breakfast bar with stools. Cornwall has many links golf courses and the mild climate makes it an ideal location for winter and spring golfing. There are several courses within a 10 mile radius of the property including Roserrow Golf And Country Club, Trevose Golf and Country Club, St Kew Golf Club and St Enodoc at Rock. Very comfortable, well appointed house that was very convenient for the town. We had an enjoyable stay at Camel Prospect. The house was comfortable, clean and well equipped. An added bonus was its closeness to the town centre with all the shops and amenities - just a two minute walk across the bridge. The entrance lane was a bit scary to start with but we soon got used to it. If we return to Wadebridge sometime we would certainly consider staying there again. Really sorry to hear that you weren't fully impressed with your stay. If you'd let us know at the time we'd have loved to have been able to help improve things for you, which is why we leave a contact number in the welcome notes. The house has a heat recovery system which could have been adjusted if you felt the bedrooms were damp. We recently had another guest review on Owners Direct which complemented the house for having 'very comfy beds' so its a shame to hear that they weren't to your taste. I really hope you had a great holiday of it all the same and that you enjoyed cycling the Camel Trail straight from the house. Had a great week. Everything you could need. Great location for beaches & tourist attractions. Hi Lynn, Glad to hear that you had a great holiday of it and you enjoyed the local beaches and attractions! You'll be very welcome to stay again in the future! Lovely accommodation in a perfect location, loved everything about it. Thank you for your lovely review Liz! Really happy to hear that you enjoyed Camel Prospect and that you had a great holiday based in Wadebridge! We really love that town is such an easy walk across the bridge too, glad to hear that you made the most of some local days without having to use the car. It's nice to have found a fellow lover of the Regal cinema too! This is our first time staying at Camel Prospect and it certainly did not disappoint. Superb location and base to visit the many incredible places and charms Kernow has to offer. Also, the opportunity to get more acquainted with Wadebridge as the walk in and around the town was always a delight. The property is first class and set-up perfectly - the bottle of French red on arrival particularly pleasing!! Sam was always helpful and super approachable which makes a big difference to your stay. Hopefully, in the very near future we'll be back to stay again. Thank you for your lovely review! Fantastic to hear that you enjoyed your stay at Camel Prospect and you made the most of being able to explore Wadebridge and the lovely spots around the area . Great to hear that the house served you well and that the red wine hit the spot! You were ideal guests and we'd be delighted to have you stay again whenever you're next heading to Cornwall! Camel Prospect was ideal for two families with two toddlers. We were visiting friends and the property was ideal for that. The property was very safe for the toddlers and well set out for sharing the house. The path up to the house is quite narrow but everyone managed! It’s very close to lots of beautiful beaches, not too far from Padstow and close to shops, restaurants and pubs. The nearest beach is 5 miles away at Rock on the Camel estuary. Polzeath, an excellent surfing beach, is 8 miles away. The north Cornwall coast features many excellent surfing locations including Harlyn and Watergate and the world-famous Fistral beach at Newquay. There are plenty of surf schools in the area. Daymer Bay on the Camel estuary is an ideal beach for smaller children. There are magnificent cliff walks and innumerable coves and bays to explore all along this stunning coastline. The nearest airport is Newquay, 10 miles away and Exeter is 70 miles away. The nearest rail station is Bodmin Parkway 10 miles away. The National Express coach from London to Penzance calls at Wadebridge and there are buses to Padstow, Newquay and Bodmin. A car is recommended. Port Isaac - 8 miles. Eden Project - 16 miles. Wadebridge is an ideal centre for exploring North Cornwall. The town lies in the sheltered valley of the river Camel and is midway between Bodmin and Padstow on the Camel Trail. The picturesque harbour town of Padstow featuring the restaurants of celebrity chef Rick Stein is 8 miles away. The fishing village of Port Isaac (location for the Doc Martin TV series) is 8 miles to the north. Tintagel with its Arthurian connections is 13 miles to the north and the world-famous Eden Project is 15 miles to the south. Booking Notes: A 25% deposit is required at the time of booking, the balance being payable 30 days before the beginning of your visit. A security deposit of £200 is requested, refundable within 2 weeks of departure, subject to all being in order. Well-behaved pets are welcome at the property. You may also be interested in our other property near Wadebridge, Owners Direct reference number E3425. Changeover Day in low season is flexible. Changeover Day in high season is Saturday. Notes on prices: All prices are in sterling per week. Please contact us for prices of shorter stays.